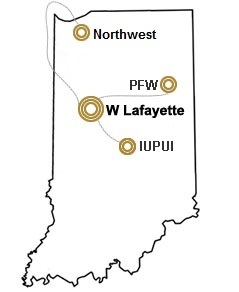 The Graduate Programs Office oversees the development of all academic graduate programs, including, all graduate degrees, certificates, concentrations, and courses for approximately 100 graduate departments across Purdue's five campuses. The Graduate Council, the faculty body responsible for making academic policies and approving new graduate programs and courses, is under the purview of the Graduate Programs Office. The GPO is responsible for implementation of academic and administrative policies involving graduate education for the system-wide Graduate School, recognizing the origin of policies and the impact of policy changes to other campuses and offices. Graduate Proposal Guidelines are found in the Policies and Procedures for Administering Graduate Student Programs manual. Click a location for more information on that campus.